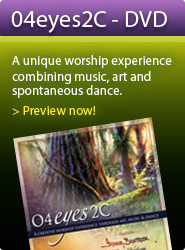 Watch beautiful christian paintings drawn in a live worship setting, accompanied by inspirational music and dance! Preview DVD Trailer below. As an Introduction to the 2011 Inspire School of Prophetic Painting, Auckland artist Graham Braddock held an informal critique session, and a live music & painting demonstration. This live performance of a christian drawing coupled with music is an idea that Graham has carried for a number of years. The project entitled, ‘Eyes2C’, involves marrying sight and sound – combining art, worship and easy listening music – and capturing it as a live experience on DVD. Read the press release below. Auckland Artist Graham Braddock is committed to assisting Christian artists to produce paintings that reveal something of God’s heart. Last year he led a successful, 3 month Prophetic Painting School At Orama, on Great Barrier Island. 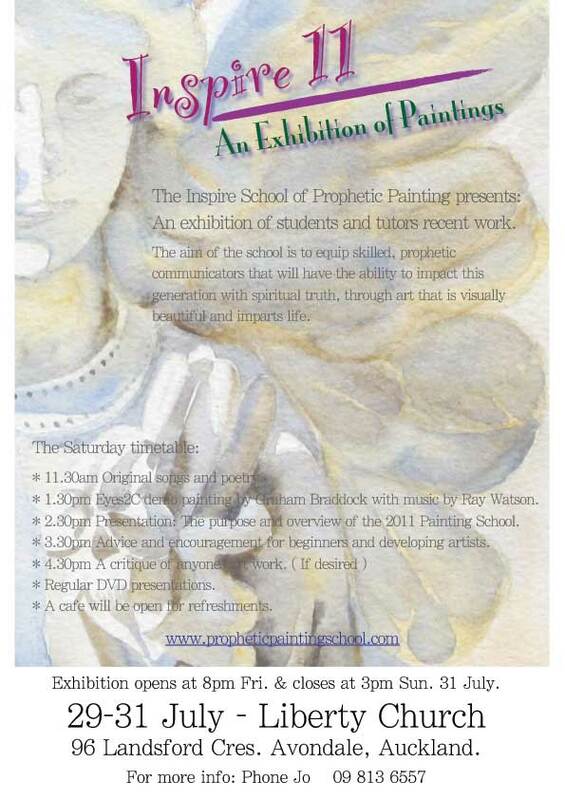 As an Introduction to the 2011 Inspire School of Prophetic Painting, the Inspire Exhibition featuring work by former students, tutors and friends will be held at Liberty Church, 96 Landsford Cres, Avondale, Auckland on Saturday 30th July. Graham plans an informal critique session, music & painting demonstration and an overview of the Inspire School in the afternoon. Interested people are welcome to bring their own art pieces for evaluation and encouragement. The 2011 Inspire School starts in September. It consists of 12, 1 week modules that build one upon the other, from pencil, to pen, to pen and wash, to watercolours, to acrylics and oils. Students can choose which modules they wish to attend. “While the School is too short to develop mastery in any one discipline, I believe it will give vision, valuable know how and opportunities to seek God for greater revelation of Himself and His creative anointing,” enthuses Graham. The live action, painting and music demonstration is an idea that Graham has carried for a number of years. The project entitled, ‘Eyes2C’, involves marrying sight and sound – combining art, worship and easy listening music – and capturing it as a live experience on DVD. Graham says, “My good friend Ray Watson, an experienced worship leader, songwriter and keyboard recording artist, is enthusiastic about the project. We plan to create and record simultaneously. I will sketch, splash and stroke a large painting into being while Ray produces an accompanying, spontaneous, musical sound track. New Zealand artist Graham Braddock and recording artist Ray Watson team up for this live collaborative event. Watch this inspiring artistic journey unfold - an original christian painting drawn live - creating a unique and rewarding worship experience. 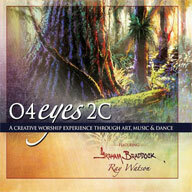 O4eyes2C makes the perfect gift to give to anyone who has an interest in art, music, dance or in christian performing arts in general. Click here for more info on how this DVD will appeal as a beautiful Christian art gift.